All of Trump’s horses and all of Trump’s men. What happens when we call people “animals”. Historical analysis of world leaders using dehumanizing language to describe groups of people as a warning against the rhetoric of Donald Trump. Twenty-five years ago, on April 6, 1994, the plane carrying Rwandan President Juvénal Habyarimana was shot down as it was preparing to land in Kigali, Rwanda. This assassination kicked off 100 days of unimaginable horror in the form of ethnic cleansing perpetrated on minority Tutsis by Hutus. This genocide resulted in an estimated 800,000 dead, roughly 70% of the Tutsi population. While the downing of the presidential plane touched off the violence, the seeds of the genocide were planted much earlier. Colonialism, a revolution, and a civil war all predated the genocide by decades, but the one constant during these periods which preceded the genocide was systematic dehumanization. As part of the reconciliation process in Rwanda, perpetrators must speak with, and seek forgiveness from, the families of their victims. During one of these conversations, Abdullah, a perpetrator who participated in the slaughter of 9,000 Tutsis in one community, was asked in an interview about what inspired him to kill. Last week, a film from 2018 of President Trump referring to some people as “animals” surfaced, but was “debunked” when the wider context proved he was referring to members of the gang MS-13. Once it was confirmed that quote was “only” referring to gang members many dismissed it as perhaps ill-conceived, but not all that bad. This willingness to tolerate dehumanizing language is dangerous and can quickly bleed over from calls for public safety, to targeted violence. Coupled with the White House statement declaring members of the violent gang MS-13 “animals” no fewer than eight times, a dangerous culture seems to be brewing in the halls of power. Official presidential proclamations of dehumanization are especially frightening when made by an administration which has advocated for human rights abuses in the form of encouraging police brutality, slaughtering the innocent family members of suspected terrorists, and engaging in torture, to say nothing of referring to parts of the African continent as “shithole countries.” Supporters of the President are quick to dismiss criticism of his words as either weakness or simply his “style,” but just as in Rwanda, when leaders speak, followers listen. In 1943, a famine broke out in Bengal, India. The origins of this famine are manifold, but the Nobel Prize-winning economist Amartya Sen lays the blame squarely at the feet of the imperial policies of the British colonial rulers. Some British officials begged Prime Minister Winston Churchill to direct food supplies to the region; he bluntly refused. Raging that it was their own fault for “breeding like rabbits” Churchill said “I hate Indians. They are a beastly people with a beastly religion.” Up to 3 million Indians starved to death during this famine. Perhaps the most well-known and extreme example of dehumanization is the Holocaust. The Nazis couched everything they did in the language of science and race, and justified their genocidal policies by referring to their victims not as people, but as animals. As the US Holocaust Memorial Museum recently told us, “the Holocaust did not begin with killing; it began with words.” The words which begin genocide are often words of dehumanization. The Nazis regularly invoked the language and imagery of disease to dehumanize Jews and other victims of Nazi tyranny. Jews, Roma/Sinti and other targets of the Third Reich were branded untermenschen, subhuman, by the Nazis. In Nazi newsreels, images of Jews being deported were overlaid with images of rats scurrying through gutters. 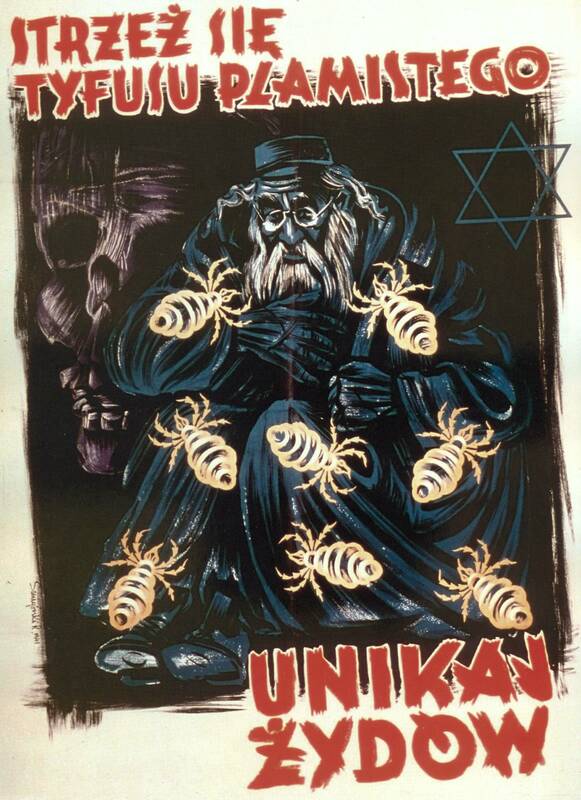 In Eastern Europe the Nazis displayed posters conflating Jews with the lice that transmitted typhus. When your enemy is no longer human it becomes easier to kill them. When that subhuman enemy is a disease-carrying threat, killing them becomes a necessity. American history is similarly tainted with the stain of dehumanization. When our country was founded in 1776 national leadership was reserved for straight, white, wealthy, landowning, Christian, men. Since then the ranks of those who are deemed entitled to full agency under the banner “we the people” has swollen, but in fits and starts. In 1790, in response to an inquiry from the Hebrew Congregation in Newport, Rhode Island about the status of Jews in the nearly formed United States of America, President George Washington wrote: “the Government of the United States… gives to bigotry no sanction, to persecution no assistance…” A century and a half later, signs like the one above could be found outside swimming pools across the country. When Dr. Martin Luther King, Jr. traveled to Memphis in 1968 to support striking sanitation workers he found the protesters wearing signs simply reading “I am a man.” These peaceful protesters were met by soldiers with bayonets, beaten by police with truncheons, attacked by dogs, and assaulted with firehoses… all for simply having the temerity to declare their fundamental humanity. Declaring ones own humanity was deemed such a threat to the established social order at the time our country nearly descended into a second civil war. As a nation we cannot tolerate our elected leaders referring to anyone as anything less then human. Attempting to devalue the humanity of others will achieve nothing except lay the groundwork for more hate and violence and, fundamentally, only diminishes our own humanity. Seated next to Hershenov during this testimony was Dr. Mohammad Abu-Salha. In 2015, his two daughters and son-in-law were murdered in an alleged hate crime in North Carolina. Four months after those murders, a white supremacist killed nine black worshipers at a Mother Emanuel Church in Charleston, South Carolina. In August 2017, a white supremacist killed Heather Heyer, who was protesting a white supremacy rally in Charlottesville. In October 2018, a white supremacist killed nine worshipers in a Pittsburgh synagogue. And just last month, a white supremacist killed 50 people at mosques in New Zealand. This spate of killings and violence is not the fault of any one individual; indeed, culpability for each crime rests with the perpetrator of the crime, but these criminals need no encouragement. The perception of the sanctioning of these crimes coming from the highest office in the land can transform dangerous rhetoric into deadly behavior. Marian Anderson, April 9, 1939. Assistant Dean in the Georgetown University Edmund A. Walsh School of Foreign Service in Washington, DC. He studies the role of science and technology in the Holocaust.